In Karachi, as in much of the rest of Asia, there is pressure on poorer groups to move out of central locations, or at least into high-rise apartments. This isn’t what the residents typically want, or can afford, but poverty doesn’t fit with Karachi’s aspirations to become a ‘world-class city’, and as in most other cities poor groups get little support from policymakers. Securing a good location is all the more difficult because low-density housing takes up large amounts of valuable space, and high-density housing is prohibited. Even with very small plots, settlements are not meant to contain more than 1200 people per hectare, and with bigger plots the limit declines to less than 500pph. Officially this is because higher densities undermine residents’ health and wellbeing. But are these limits really suitable? 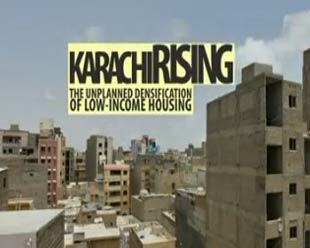 For the study, Arif Hasan, Asiya Sadiq and Suneela Ahmed looked at four lower-income housing sites in Karachi. Three are settlements with houses built up on small plots. Khuda Ki Basti was only settled recently and is still only lightly populated. Nawalane is old and extremely dense. Paposh Nagar lies somewhere between these extremes. The fourth settlement studied, Fahad Square, is an apartment complex. As described in the working paper, household surveys were undertaken in each of these settlements, densities were calculated and mapped, and the settlements were hypothetically redesigned via computer modelling to explore whether, with the right sort of support, high densities could have been achieved in such settlements with relatively low-rise, flexible, high-density housing design. Decent, affordable and accessible housing for all city dwellers is surely a desirable goal. However, in a large city like Bangkok (official population: eight million in 2010) ensuring adequate and affordable housing for all can be difficult. There are multiple competing pressures for land, and private commercial developers play a big part in shaping both land and housing markets. One approach to maximising land usage is through high-rise construction ("densification"). However, few private developers cater to the lower income bracket; low-income households have historically moved into informal settlements in the city, where neither household nor settlement density may conform to official standards. Official policies for low-income groups in Thailand have ranged from provision of public housing in the form of flats, to "sites-and-services" upgrading1 (Giles, 2003).However, the main obstacle to providing public housing has been the availability of affordable land on which to build. More recently, in 2003, Thailand adopted a two-pronged approach to housing: demanddriven, through the innovative Baan Mankong participatory slum upgrading programme (Boonyabancha, 2005); and supply-driven, through the public housing approach of Baan Ua- Arthorn. Only Baan Mankong continues to be implemented today. With a population of over 1 million and an annual growth rate exceeding 4.5 per cent, Kathmandu is struggling to keep pace with growing demand for affordable housing. The housing scarcity is made worse by zoning byelaws and building regulations that impose excessive restrictions on development. To meet growing housing demand, most development is occurring beyond the legal limits of such byelaws and regulations. As settlements densify haphazardly, affordable housing options (particularly in the informal rental sector) are increasing, but living conditions, services and crowding are worsening. The disastrous consequences were starkly revealed when Kathmandu was struck by an earthquake on the 26th of April 2015 followed by a second on the 12th of May. As the Guardian reported, about three-quarters of deaths were caused by building collapse, with low-income residents living in informal buildings bearing the brunt. The Guardian further highlighted poorly designed and constructed buildings, not the earthquakes, as the real cause of the disaster. The current priority in Kathmandu is recovery. But much more will need to be done to provide better housing for the residents of Kathmandu, and to reduce the risks they face from future earthquakes and other environmental hazards. This study looks at how these challenges can be met. It focuses specifically on the poorest and most vulnerable residents, and seeks out ways of addressing the shortfall in affordable housing without compromising unduly on safety and liveability. Like the Karachi study, hypothetical redesigns were undertaken in four types of settlements (each representing the different ways in which the city is growing and densifying) to contemplate how this can potentially be achieved through urban design and regulatory reform. Hopefully the lessons learnt will contribute to a safer and more liveable Kathmandu in the future. This section links to research material by city. Documents and links listed under each city are sourced from organizations other than IIED. They have either been reproduced with permission, or are linked to other websites.